FUSELAGE DESIGN: The square-shaped fuselage and cabin offer maximum usable space for occupants. The two-seat STOL CH 701 cabin is designed for side-by-side comfort and is surprisingly roomy for an aircraft of its size and weight. The cabin area utilizes a 4130 chrome-moly (chromium-molybdenum) welded steel tube frame top assembly. The tube frame allows for maximum visibility, and incorporates attach points for the wings. The lower cabin is made up of a factory-riveted bottom-side assembly that gets joined to the top tube frame. The cabin is fitted with two large doors for easy access to the cabin. The boxy rear fuselage lends itself for very easy assembly, allowing each of the four flat sides to be built individually on a flat workbench, and then simply boxed together to form the rear fuselage. The forward fuselage section (cabin area) is build separately, and then joined to the rear fuselage section. 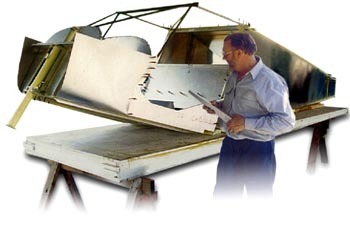 The aircraft wings are designed for quick and easy attachment and removal from the fuselage. Modular Construction: Throughout, construction of the STOL CH 701 kit aircraft is modular  each section of the aircraft is built separately on the workbench. Many builders thus choose to buy component kits, purchasing kit sections as they progress through the project. The modular construction of the kit means that required workshop space is minimal  most builders construct the kit in a single-car garage or basement workshop. Once all the airframe sections have been assembled, the wing and tail sections are bolted to the fuselage and the landing gear, controls, and fuel system are installed. Click here for a schematic view of the entire fuselage assembly. Design Article: "Anatomy of a STOL Aircraft: Designing a Modern Short Take-Off and Landing Aircraft" by Chris Heintz. HomebuiltHelp.com offers step-by-step instructional DVDs specifically to help STOL CH 701 builders with the project. Titles include "Building your Zenith STOL CH 701 - Forward Fuselage" and "Building your Zenith STOL CH 701 - Forward Fuselage"